The auto parts business is sputtering. 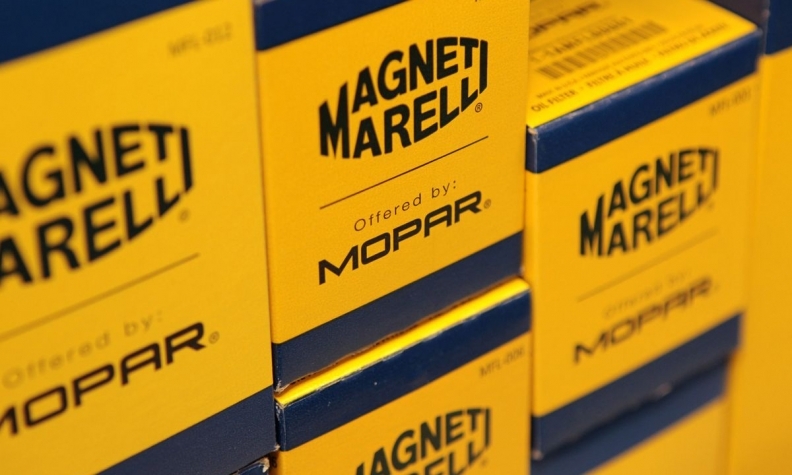 Enter private-equity giant KKR & Co.
KKR is in talks to acquire Fiat Chrysler Automobiles' parts unit, Magneti Marelli SpA, Bloomberg News reported last week. KKR would likely roll the business up with Calsonic Kansei Corp., the Japanese parts company KKR bought from Nissan Motor Co. in late 2016. Put the two together and you have a car parts giant valued at as much as $11.6 billion. The surprise isn't that Fiat Chrysler wants to shed Magneti — its board earlier this year approved a spin-off, with the intention to list the unit by the end of this year or early next. Rather, it's that the company sought a private-equity firm to handle it. And yet a private-equity style consolidation is just what this flailing industry needs. Creating a behemoth would put bargaining and pricing power, now lost to carmakers, back in the hands of the parts industry. Nissan sold Calsonic Kansei to KKR to unshackle itself from a captive supplier and increase its ability to source parts globally. Funds from the sale would also bolster Fiat Chrysler's investments in other areas, like electric cars. A union of parts makers of this scale would be efficient, too. Calsonic does run-of-the-mill parts such as mufflers, air conditioning systems, exhaust parts and radiators. It supplies the likes of Nissan, Audi AG and Suzuki Motor Corp. Magneti Marelli makes parts such as electronic systems and suspension systems, along with aftermarket parts and services for companies globally. The plight of the maturing and deeply fragmented car-parts industry is multifold: Growth is slowing in the world's largest car markets; technology needs are rapidly changing; and fuel economy regulations are getting stricter. Parts from low-cost countries are squeezing out existing players. Add to that ructions from the U.S.-China trade spat, and companies are feeling the heat. China, meanwhile, has focused its industrial policies on boosting the parts industry, adding pricing pressure on small U.S. suppliers and reshaping the home market. The country exports $70 billion of parts like motors and gearboxes to the rest of the world. With all these headaches, carmakers' urge to shed their parts units is understandable: They simply can't sink much more into these businesses, particularly as electric and autonomous-vehicle targets loom. Their returns on capital are also dropping. On average, carmakers have had to add more than $4,000 per car since 2012 to keep up technologically — and costs are only expected to balloon further. They will spend more than $250 billion a year on research and development and capital expenditure by 2023, on more than 200 electric-car models, many of which will lose money. Some $60 billion has been set aside for autonomous vehicles, a study by consultancy AlixPartners found. Across the world, auto parts suppliers' traditional business models aren't working. The stock price of Germany's Continental AG, one of the world's biggest manufacturers of parts and tires for cars and trucks, tanked 17 percent over two days last week after the company issued its second profit warning this year. Low profits continue to dog its business, as the company absorbs costs pushed down by struggling carmakers. Japan's Pioneer Corp., a smaller maker of electronic equipment for cars and other industrial companies, is also looking for a lifeline. It's in talks with companies, including Calsonic Kansei, for financial help and business alliances, and is even willing to transfer some of its operations to form a joint venture, Nikkei reported earlier this month. Continental's plight should be a warning to the barbarians at the gate, though. Despite its scope and recently announced revamp, its business is struggling, and investors aren't convinced. KKR's new giant may also find a formidable competitor in China's largest auto parts supplier. Huayu Automotive Systems Co., majority-owned by carmaker SAIC Motor Corp., has started consolidating at home, quickly buying up smaller players. It has joint ventures with the likes of Robert Bosch GmbH, too. Auto parts makers from Europe to China and the U.S. are trading at discounts of 20 percent to 30 percent to their five-year price-to-earnings multiples. KKR may have arrived at just the right time.